In America, milk production became a business in the early 1800’s and soon became a large business sector with cooperatives spanning the states and agricultural colleges offering classes and degrees in dairy husbandry and production of milk products. In 1798, Edward Jenner used the arm of a Dairymaid healing from cowpox (a non-fatal variant of small pox) to “vaccinate” his own children, therefore creating immunity for them from small pox, which was the first step toward the eradication of a major disease. By the late 1800’s, commercialization of farming and the desire to keep the cows (and therefore the product) closer to the consumer led to ill-suited animal welfare and public health safety conditions. In 1917, the U.S. government required the pasteurization of milk for consumer consumption only if the cows were not tested to be free of tuberculosis. Along with tuberculosis, people can contract a sickness referred to at the time as “undulant fever” or “Bang’s Disease” which was brucellosis, a bovine disease with the ability to cause sickness in humans and abortions in cattle. Today, most cattle are routinely tested for tuberculosis (which requires the vet to implant a serum and then return after a specific amount of time to read the results). Also, a nationwide vaccination program regulated through the U.S. government for decades has essentially eradicated the Brucellosis concern in the United States. The raw milk debate has quietly been a concern of the government (as seen through concerns for tuberculosis and brucellosis) but the nationwide debate over the rights of people to purchase and consume raw milk legally escalated in the late 1980’s around the time of the founding of the Weston A. Price Foundation, a foundation with the belief in eating raw foods for health purposes and willing to fight for the protection of people’s rights to be able to purchase food they are wanting to buy for their own use. Currently, most states work together with farmers to meet consumer needs while the FDA targets raw milk as a particularly harmful food and is in a fierce battle between small farming industry and consumer rights versus perceived public health safety. With the growing controversy over the past several years, state governments started creating specific rules for or against the legal sale of raw milk in various forms. Following are some examples: Washington State allows sales of raw milk in stores or at farms if the farmer is certified Grade A. The state of Georgia quietly allows raw milk to be purchased as “pet” food. Massachusetts allows farmers selling bulk milk to a cooperative to sell up to 30 gallons of milk per week from their home (they are not allowed to sell the farm’s milk anywhere except on farm property). Virginia advocates “herd shares” which results in the partial purchase of an animal and each owner receives a percentage of milk produced by that animal each week. The Food and Drug Administration bans the intrastate sale (from one state to another, unless only for personal consumption) of raw milk and imposes the Federal Pasteurized Milk Ordinance (PMO) for voluntary operating procedures that states can choose to adopt. 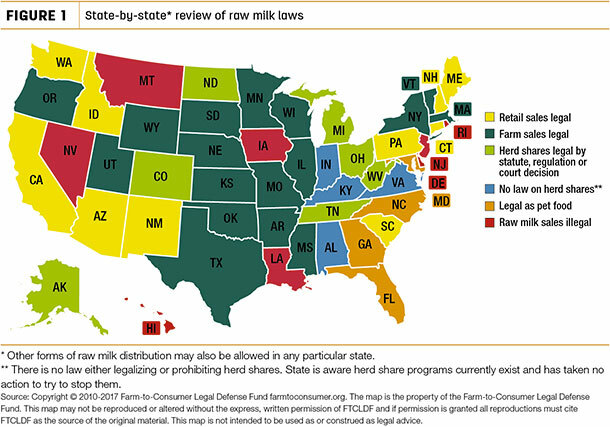 Although the PMO implies all milk must be pasteurized, 32 states allow the legal sale of raw milk for human consumption and 39 states allow certain forms of raw milk sales (albeit some states simply allow sales as “animal feed” with no regulation). Between 1993 and 2006, the same amount of states allowed for legal sale of raw milk. According to the Food and Drug Administration (FDA) and the Centers for Disease Control (CDC), raw milk is extremely harmful and should never be consumed. Although very recent documents claim this opinion, their “proof” does not fully explain the situation. For example, the major flaw in the March 2012 article published by the CDC indicates that non-pasteurized milk products caused 2 deaths and pasteurized milk products caused 1 death. My question is this: Why did the researchers stop the report at 2006 when their report was written after 2010 and published in 2012 and while I am able to access information through 2009, especially considering that one year (2007) after the end of their data, 2 people died from pasteurized milk products containing the bacteria Listeria, which would change the ratio from 2 deaths from raw milk products and 3 deaths from pasteurized milk products? 1. 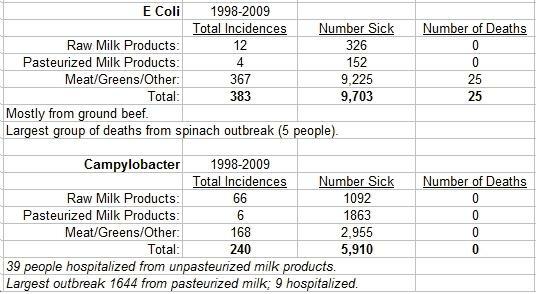 How many deaths has raw milk caused in comparison to other foodborne related deaths (or “Is raw milk more fatally dangerous than other foods?”). Raw milk is implicated in the deaths of two individuals from separate events. The diseases include one death from Listeria and one death from Salmonella. In relation, pasteurized milk is implicated in the deaths of four people over two incidences. The diseases came from Listeria contamination of skim milk (3 deaths) and one death from a pasteurized cheese product. Therefore, pasteurized milk products are implicated in twice as many deaths as raw milk products. Granted, people may consume more pasteurize products than raw. Listeria is a common bacteria referenced as a concern for pregnant women in particular due to the ability of the bacteria to cause women to abort fetuses. The number one cause of deaths from Listeria (and this is humorously terrible!) came from a hot dog outbreak, killing 21 people. The second largest Listeria outbreak killed 7 people and came from deli turkey meat. In total, meat products contaminated with Listeria caused 42 out of 48 deaths (42 plus 1 for pasteurized milk, 1 for raw milk, and 1 “other”)! One has to wonder, knowing that information, whether a fight against raw milk is the best use of taxpayer money? Perhaps more stringent enforcement of food handling regulations could cut down on the number of contaminated meat products, therefore having a realistic effect of decreasing the number of actual deaths from Listeria in foodborne outbreaks from meat products. In comparison, raw milk products were implicated in 2.5 percent of total sicknesses and pasteurized milk products in 4.5 percent of total sicknesses. Compare that to the high incidences of illness from meat products and you could argue pretty convincingly that milk products are “safer” to eat than meat products. In comparison of deaths, raw milk is implicated with 1.4 percent of deaths and pasteurized milk products 2.9 percent of deaths. Raw milk consumption is estimated at 1 percent of food consumed, so the consumption and death ratio is well within statistical deviation. Further, due to the increasingly watchful and strong nature of the government disapproving of the consumption of raw milk, the number for consumption is likely much higher than figured. In addition, the increasingly large percentage of people in the United States raising their own dairy animals adds to the number of consumers and there is no way of tracking those consumers from home currently (and hopefully there never will be, if we continue to live in a “free” state). Salmonella is the most commonly implicated bacteria for illness, then Ecoli O157:H7. Exposure Assessment: Who is at risk? Those most exposed to raw milk are owners and operators of agricultural enterprises. A question could be asked as to whether or not owners and operators are therefore the highest percentage of sicknesses from consumption of raw milk and raw milk products. (Considering the number of cows nationwide that have Staph Aureus infections, zero people have gotten sick from Staph Aureus milk!) Contrary to that suggestion, evidence indicates that farmers themselves are actually rarely found ill from their own products. “Summary Evidence suggests that frequent and direct exposure to domestic animals has made farmers less susceptible to symptomatic Escherichia coli O157 infection than other members of the community.” A valid theory as to the immunity of farmers comes from the fact that farmers are exposed to small doses of bacteria of all kinds on a daily basis. A study of school aged children “reported raw milk consumption was inversely associated to asthma, atopy, and hay fever, independent of other farm exposures.” Farmers and their children are effectively building up immunity. Contrary to popular opinion, more frequent exposure to raw foods, animals, and soil can help build immunity in children and adults. Those most susceptible to falling ill from raw milk products are those under the age of 20, according to the CDC. People living in the city, particularly young children, have not built up immunity to bacterial infection simply due to the fact that their bodies are not exposed to the bacteria often enough to build and maintain immunity in their system. Therefore, when exposed (such as through the purchase of a milk product) they are more susceptible than their farming ancestors or current farmers. (Farming as an occupation plummeted from around 90 percent in the early 1900’s to less than 2 percent at the end of the century.) This lost immunity is not limited to raw milk products by any means. Many food products are going through pasteurization and heating procedures (all fruit juices, all canned foods, and most processed foods) to the point that people no longer have immunity and also no longer get beneficial enzymes to keep their system functioning strong. Proponents of raw milk also argue for the right to purchase the food products due to the fact that pasteurization decreases vitamin C and ascorbic acid, also Vitamins B2, B12, E, and folate (The B2 decrease was of particular concern to researchers). Raw milk products provide the necessary vitamins and enzymes for digestion, reducing lactose intolerance issues and promoting a health immune system. Small, regular exposure to bacteria is the best preventative method for protecting humans and their food sources. The most common sickness from raw milk products comes from campylobacter, yet campylobacter is not implicated in ANY foods for causing death. Furthermore, many cases linking raw milk to campylobacter end up with lack of evidence because the campylobacter bacteria are rarely found in the milk products. Rather, contamination comes from packaging or water source. Steps to prevent campylobacter contamination include basic sanitation such as washing hands and not cross contaminating products before cooking. Campylobacter arises from unclean water sources (so producers should test their water and maintain clean pipelines) and milk products end up being a carrier of the bacteria. The second highest concern for sicknesses from raw milk is Salmonella, which also comes from improper handling and sanitation. With that evidence, and with the fact that people are going to continue to want to drink raw milk and eat products made from raw milk, protocols to assure testing procedures and factors affecting microbiological flora are instituted are needing to be more frequently regulated to ensure that products contain enough beneficial microbes to allow the natural flora in milk to work against potential pathogenic contamination. Evidence indicates that food contamination comes from a variety of bacteria and other health concerns and can be attributed to many foods. Meat products are often already cooked, as well as cheese and other processed foods known for causing sickness. Prevention may be the answer rather than concerning ourselves with which foods to eat or not to eat. First, taking steps to promote food safety protocols in the food industry will be a big influence. Many groups and government agencies are advocating for each individual state to form regulations for the consumption of raw milk. Due to the lack of evidence that raw milk is any more harmful than other meats, it is the opinion of this writer that finances will be better spent focusing on food handling education rather than targeting specific foods. When given a choice between raw milk cheese and pasteurized cheese (samples were identified for some consumers and not identified for others), consumers much preferred the taste of raw milk cheese. In addition, they became more willing to accept the raw cheeses as safe when explained to that the cheeses were made using FDA approved processes. Therefore, maintaining high standards for food safety through Hazard Analysis & Critical Control Points (HACCP) and Standard Operating Procedures (SOP) and providing government funding for the continued monitoring and enforcement of standards will benefit consumer food safety. Increasing awareness within households about proper care of food products may help. A good majority of raw milk products (almost all) were consumed within the home. One of the concerns with any milk products is improper handling, such as purchasing the milk on a warm day and finishing your shopping and driving around, presuming the milk may not get refrigerated for up to several hours. Milk products of any kind must be kept at or below 40 degrees Fahrenheit or risk premature growth of harmful bacteria. Promoting immunity over sterility is smarter for the long term safety of people from disease. Further exposure to both animals and soil can help build immunity in children rather than try to prevent all transmission of bacteria, which is impossible. For those with immune-compromised systems, the first step should be to eat only simple foods prepared at home or in a very sanitary environment where quality control can be met. The use of probiotics in powdered form are a much safer way of building up the system of a sick person rather than risk foods that may or may not have enough beneficial bacteria to support proper safety and digestion. Also, pregnant women should consider limiting high risk foods to prevent Listeria contamination, although again research indicates that Listeria may be found in a number of sources. The greatest challenge is to work toward a healthy immunity to disease along with proper food processing and handling procedures to find a balance for food safety. MacDonald, L.E. ; Brett, J.; Kelton, D; Majowicz, S.E. ; Snedeker, K.; Sargeant, J.M. A Systematic Review and Meta-Analysis of the Effects of Pasteurization on Milk Vitamins, and Evidence for Raw Milk Consumption and Other Health-Related Outcomes. (2011 Nov). Journal of Food Protection 74, 11, p. 1814-1832, 19p. Vaccination has all but eradicated the disease (5 total incidences in the CDC reports for foodborne illness over the period of 1998-2009), except for the problems occurring around Yellowstone Park, where the National Park Service refuses to vaccinate Bison on grounds of maintaining historical significance and not interfering with what they call a “native” species, although the current Bison are actually implanted from plains herds and are not native Bison. To read further on the subject, I recommend: Alston Chase. Playing God in Yellowstone: The Destruction of America’s First National Park. Published 1987. Moltó-Puigmartí, et.al. Effects of Pasteurization. Nero, et.al. The fate of indigenous microbiota. Colonna, et.al. Factors affecting consumers’ preferences. I don’t know if you will get this but I was very impressed with your arguments. Bottom line should be personal responsibility and personal choice. I believe the public is lulled into a false sense of security by all the “government protection” they think they have. I had to go in 28 or so pages in my search to find your article. I got it! I appreciate you taking the time to write. I agree with you as well, there is a certain level of government that is appreciated but there also needs to be a certain level of personal responsibility for each of us! I’m sorry but you are miss leading the public. One failure in the incident analysis is not have the number of people consuming the food item. 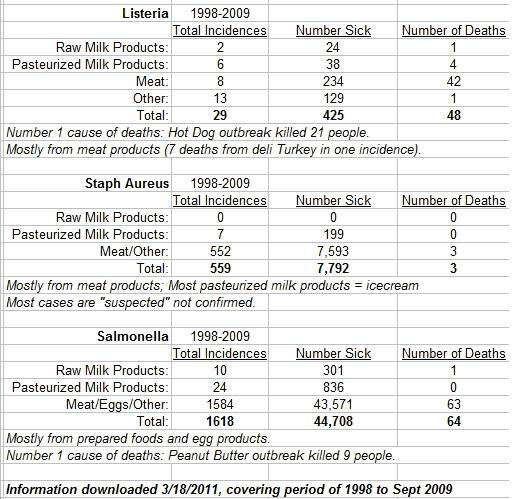 Take listeria incident chart, although there are only 1 death for raw milk consumers , which seems low, and 4 in pasterized milk the incident rate extremely high with raw milk when taking into consideration the number of people consuming the raw milk products versus the number of people consuming pasturized milk products. Most people don’t admit if they do drink raw milk, as it is #1. Harrassed by doctors and #2. Illegal in most states. Science is for the most part educated opinion, ours differ!